Polymerase chain reaction1 (PCR) is a simple and inexpensive technique to make multiple copies of a targeted nucleotide sequence from a DNA sample, and to amplify sequences from small samples. This technique is widely used in genetics laboratories that work with DNA and RNA. Because PCR amplification is extremely sensitive to contamination, prevention of contamination requires good laboratory practices to minimize external or cross-contamination during reagent preparation, sample preparation and Air Science® PCR laminar flow cabinet employs the Air Science Multiplex™ HEPA filtration technology to create a safe, energy-efficient contaminant-free environment. It is ideally suited for use with non-hazardous contaminants and when flexible access to the instrumentation in the cabinet is required. Laminar Flow Cabinets are shipped fully assembled with standard power cords; no installation required. The integral UV lamp fixtures are pre-installed. All filters are pre-installed, easy to access and easy to change. Products are designed for desktop use, or may be installed on an optional base stand or mobile cart. The high capacity air handling system delivers flow velocity of 0.45 m/s or 90 fpm. 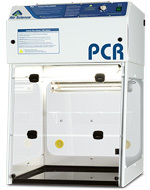 Our PCR cabinets are constructed of steel with a microbial powder finish coating. Select one of our PCR line above to learn more, or contact us today for a customized quote based on your application. The Purair PCR workstation offers protection by laminar flow for PCR amplification handlings that are extremely sensitive to contamination with ease of UV decontamination and sterilization cycles.